UIG is the top manufacturer of welded steel tanks of all capacities, from small applications of ten thousand gallons to the largest industrial tanks measured in millions of gallons. We offer individual tanks as well as complete packages that include all appropriate peripheral equipment and systems. Naturally, the metallurgy of your tank and its peripheral equipment will be properly selected for its expected contents. There are two types of welded steel tanks – shop fabricated and field installed (or “shop-welded” and “field-welded”). Both are commonly installed above ground and are used to store many different products, either as interim storage before being transferred elsewhere or for long term storage. The tanks are constructed and completed in the fabrication shop for later shipment to the job site. Prior to final finishing in the shop, the tank is sand-blasted, painted and prepared for shipment. 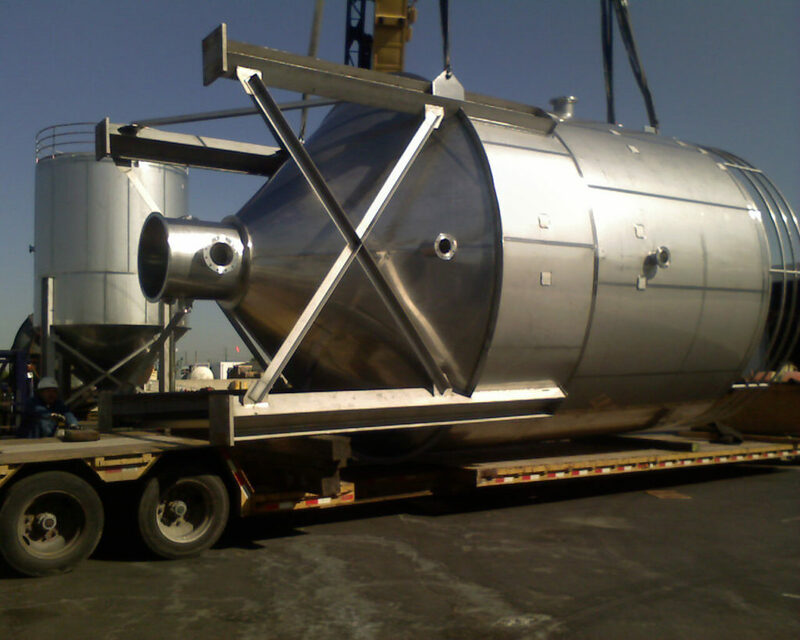 When complete, the tank is loaded onto a truck for transfer to your site for installation. Naturally, such shop-fabricated welded tanks are restricted in their dimensions to allow them to be transported on public roads. Shop fabricated or field welded tanks may only require a simple connection to the piping systems to be ready for use. Or, in contrast, they may be part of complex systems requiring installation of pumps, valves and other equipment prior to full operation. They may be joined together by overhead walkways and require external stairways and/or external and internal ladders, perimeter guard rails, shell and deck man-ways, vents and numerous inlets, outlets and monitoring points. In any case, UIG brings expert design and construction skills to your project. Our design team will determine the size and capacities of your welded tank and for all accessories – piping, pumps, valves and more – to meet your needs.